Is Inflation the Mouse that Roared? Concerns about inflation have central banks jumping through hoops. At even the squeak of inflation, central bank policymakers huddle and make plans to become more aggressive. But for every squeak from inflation, recently there has been a step back or moderation. Inflation in the U.S. much closer to target but nowhere does inflation seem to be threatening to turn to deflation. In Japan, inflation is too calmed. Europe inflation is muted. In once-high inflation Spain, the HICP pace is at 1.5% year-on-year. Spain’s domestic CPI gauge is up by only 1.1% with the ‘core’ CPI up by less than 1% logging a 0.9% gain. Spain is a real success story...sort of. Spain, once one of the most inflation prone countries in Europe, seems to have conquered its inflation monster. Yet, it has not done so while failing to tame its high unemployment rate. Spain’s unemployment is at 16.1% in March. It’s the second highest rate among original EMU members plus Greece. The highest rate is in Greece. And Spain’s unemployment rate is well above Italy’s third place standing where the unemployment rate is 11%. Spain, as of March, is tied for the fourth lowest year-on-year HICP gain among the 11 original EMU members plus Greece. Spain’s inflation is low, but the economy is still not firing on all cylinders. Is that success? Since the EMU does not have a fiscal policy and since fiscal policy by individual members is monitored by the EU Commission and as debt and deficits have their own separate parameters, the EU-EMU framework has resulted in deflationary policies. Countries have been forced to commit to austerity. As a result, we have traditional high inflation Spain, Portugal, Italy and Greece running some of the lowest inflation rates in the EMU (all are under 1% as of March) and their average unemployment rate is 13.8% compared to 8.6% in the EMU. Is that success or the price of success? Of course, the EMU members signed-on for this and for an ECB that would be made in the image and likeness of the former Bundesbank. This arrangement reminds me of why Singapore was taken so easily in WWII. It had fixed gun emplacements and they were pointing the wrong way when the attack did not come from the sea. Similarly, the whole Bundesbank-like arrangement was set up to stop and to contain inflation with no thought of how to combat deflation or disinflation or how to boost an inflation rate that became too low. In addition, Germany fought ECB stimulus every step of the way all but ensuring that it would be less effective when implemented. And it was. Today these legacy effects still haunt the EMU. Spain is a good example. Year-on-year the diffusion calculation comparing price increases by categories over 12 months to what they were 12 months ago shows a reading of 0.27. 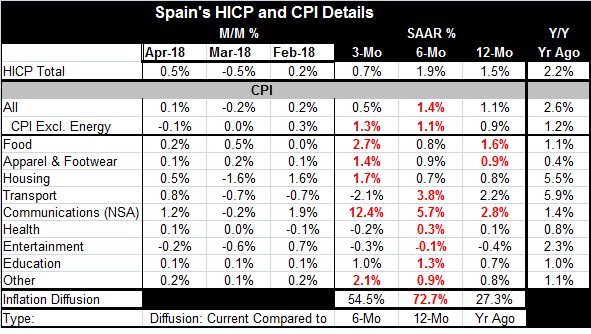 This reading is far below the inflation-neutral mark of 0.50 and it shows us that inflation is still broadly decelerating year-over-year in Spain. The current Spanish CPI pace is at 1.1% while a year ago it was at 2.6%. Over six months Spain’s inflation rate rises to 1.4%, higher than its 12-month pace of 1.1%, producing a diffusion reading of 0.73- showing substantial breadth to inflation’s pick up. But then, over three months, inflation is at a tepid 0.5% pace, far below its six-month pace of 1.4% with diffusion at 0.54, barely above the inflation-neutral mark of 0.50 showing only very modest upward pressure on inflation in diffusion terms. On balance, Spain shows weak inflation by the numbers and it shows moderate breadth of inflation pressures on its diffusion gauges. The category ‘communications’ (which is not seasonally adjusted) shows the largest gain over three months with food at a 2.7% pace the next largest. There are three-month declines in transportation prices, health care prices, and entertainment. Spain does not seem to be cooking a higher pace for inflation. But the European Central Bank is ever vigilant. Under Mario Draghi, the ECB has gone about as far as it could to try to arrest the economic weakness and the price-target undershooting. But the ECB also has hawkish board members that keep the ECB ‘in line.’ As we have seen elsewhere, globally, getting inflation back up can be difficult. There is one exception to this, in the U.K. where with Brexit threatening the BOE engineered a rate cut that destabilized the pound and brought a shock of inflation mostly through the import channel. That is now starting to settle down and to come under control. Of course, for EMU members no such policy is possible since they are locked in the same euro area with one exchange rate to rule them all and in the dark to bind them! I may have confused that phrase taking it from a modern movie instead of from the ECB’s charter. It does seem nonetheless apt. Another test of the EMU, EU and ECB seems in the offing as Italy tries to form a government. It is not yet clear what will emerge from the Italian election tangle. There is one statement made by the parties forming this government that I found intriguing. And that is that a Five Star spokesman said that it would be communicating with the EU about its fiscal decisions. The Five Star movement has a plan to provide universal income for the poor slash taxes and stop a coming VAT increase. The spokesman says that the (new) government will be rational and reasonable with public accounts and will ’discuss any planned budget deficit increases with Brussels first’ (Source here). It will talk but will it obey? Stay tuned. The question for Europe is whether it has paid a price too high for the inflation progress it got. Europe is now a clear inflation success. But Italy’s level of real GDP is below where it was a decade ago- not just the growth rate of GDP but GDP itself! And a number of countries still have quite elevated rates unemployment. Meanwhile, Germany is running budget surpluses and it plans to stiff NATO on the two percent of GDP contribution it owes. Every country has to set priorities. I guess defense is not one of them for Germany. No wonder it opposes the U.S. trying to tighten up the deal with Iraq; Germany want to do business with them, earn profits, create more tax revenue. Tell me...What’s wrong with this picture? Does inflation represent national welfare more than low unemployment? Where should countries place their priorities? What deal with the devil has Europe made and how long will it last? Will Italy light the spark that raises new flames in Europe? Greece might not have been so important but Italy is. What is the expression? Here we go again? Will tiny, anemic, inflation prove to be the mouse that roared that put Europe back on its heels?